A round of golf can be surprisingly tough on the legs, and with the turning action required from a swing, ankle injuries can ruin your enjoyment and your game. Falke GO Stabilizing Medium Volume Ankle Support Socks for Golf work in the principle that the more stable your joint, ligament and muscles action is, the more efficient and protected you will be, particularly around the Achilles tendon. 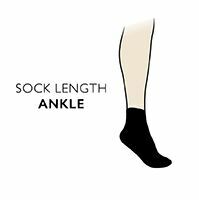 Falke GO Stabilizing Medium Volume Ankle Support Socks for Golf are moderately cushioned for direct shoe contact, anatomically shaped to be left/right specific and with Falke’s patented toe box for a seamless, perfect fit and wrinkle-free wear.